Chagall studied briefly with a local artist in Vitebsk, and in 1908 studied at the Academy in St. Petersburg. In 1910 he went to Paris, where he would live for most of the rest of his long life. There he met poets Max Jacob, Blaise Cendrars, and Andre Salmon, and the painters Modigliani, Delaunay, La Fresnaye, and other Cubists and Independents. 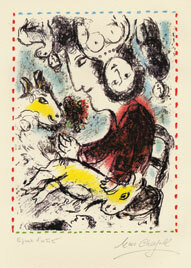 The complexities of Chagall's aesthetic are apt to be obscured somewhat by the whimsical fantastic subject matter. It does not detract from Chagall's uniqueness of expression; however, to attribute to Cubism an early and formative influence upon this gifted Russian. The impact of cubist structure and spatial handling is evident in his I and My Village, 1911, and Over Vitebsk, 1916, both in the New York Museum of Modern Art. Thereafter, his style becomes increasingly unique and the cubist aspects operate less evidently. Apollinaire introduced Chagall to Herwarth Walden, the German publisher and dealer in Berlin, 1914. 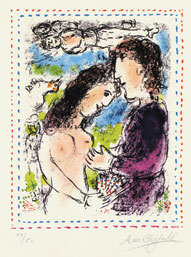 This resulted in Chagall's first one-man show in the same year. He returned to Russia to marry, and after the Revolution of 1917 he was appointed Commissar of Fine Arts for Vitebsk, and founded an art school there. He designed murals for the Moscow Jewish Theater in 1922, and then left for Paris by way of Berlin, where he stayed long enough to make engravings as illustrations for a book. The poet Cendrars was responsible for Chagall's meeting with the art dealer Ambroise Vollard, and his first retrospective exhibition was given at the Barbazange-Hodebert, Paris in 1924. His style became increasingly romantic and devoted to fantastic narratives during the middle 1920's. 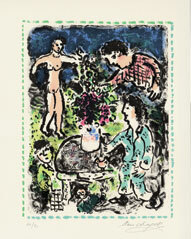 Chagall's first lithography plates (30 in all, 1992-23) in Berlin, were executed in crayon on lithographic paper. The Jewish Wedding (1926, New York Museum of Art), a gouache and chalk composition, disclosed another tendency of his Russian origin. His first New York show dates from 1926. In 1927, he undertook the illustration of La Fontaine's Fables completing 100 plates in 1930. In 1931, he traveled to Palestine and Syria to study themes for Biblical engravings, another Vollard commission.